Empire of the Sun is screening at Museum of the Moving Image on Saturday, December 21, at 6:00 p.m., as part of the series See it Big! Great Cinematographers. The series, and this article, are presented in partnership with Reverse Shot. Let’s not talk about the “Spielbergian glow,” if only for a moment. Most discussion of Steven Spielberg’s visuals tends to focus on the quasi-spiritual shafts of light that emanate from every nook and cranny of his movie frames. We must widen the aperture a bit for a genuine and fair analysis of the texture and meaning of Spielberg’s cinema. Spielberg doesn’t create plastic worlds but rather vivid, authentic, naturalistic environments, so that the magic or danger, when it intrudes, seems all the more extraordinary. Since Schindler’s List (1993), Spielberg has been inextricably linked with cinematographer Janusz Kaminski; the two have proven to be quite a duo, with a commanding visual force, limning the landscapes of future dystopias (A.I., Minority Report) and the distant American past (Amistad, Lincoln) with equal lyricism. There’s an exquisite detachment to these later films; one could hang any frame of A.I. on a wall. But Spielberg’s most naturalistic, emotionally penetrating work was made in the 1980s with cinematographer Allen Daviau, who shoots with a devotional warmth rarely seen in films as scrupulously designed as Spielberg’s. Consider Spielberg and Daviau’s three features together: E.T. the Extra-Terrestrial (1982), The Color Purple (1985), and Empire of the Sun (1987). They are the director’s most intimate films, each intensely focused on only a handful of characters while at the same time taking in an entire universe of emotion. When we think of E.T., the image that first comes to my mind is the curiously benevolent face of Henry Thomas’s Elliott, often captured in keen close-up. The latter two titles take on an epic quality—The Color Purple spans some forty years, and Empire of the Sun intentionally has the sweep of David Lean’s work. Yet rarely has Spielberg’s camera so lovingly palpated the inner worlds of his characters as it does with those films’ Celie (Whoopi Goldberg) and Jim (Christian Bale), respectively. Spielberg is, of course, latter-day Hollywood’s most preternaturally gifted visual storyteller, and one can claim a uniformity of purpose in the composition and lighting throughout his oeuvre, but there’s little denying the affecting graciousness and specificity in his work with Daviau. This is where the technical craftsmanship, so startlingly clear in Duel (1971), Jaws (1975), Close Encounters of the Third Kind (1977), 1941 (1979), and Raiders of the Lost Ark (1981), begins to feel like an expression of an empathetic humanity rather than a result of geeky expertise. Spielberg and Daviau’s working relationship is particularly endearing as it reflects the former’s loyalty despite his stature as an industry behemoth. Prior to E.T., Daviau had never served as cinematographer on a major American feature film. Spielberg reached out to him because of their history together. The two had met in their twenties, and were kindred spirits: both had been movie-obsessed kids experimenting with their own 8mm and 16mm cameras, respectively, and later both were Hollywood “gate-crashers,” learning their trade by sneaking onto movie sets and observing others at work (Daviau learned a lot by watching legendary DP George Folsey, of Meet Me in St. Louis and Forbidden Planet fame; Spielberg hung around such auteurs as Hitchcock and Cassavetes). In 1967, Spielberg asked Daviau to serve as director of photography on what he hoped would be his first serious film, titled Slipstream. Yet Spielberg insisted this short about high-speed bicycle racers was to be shot on 35mm, a gauge with which the still inexperienced Daviau was not confident. Instead he recommended French cameraman Serge Haignere, and Daviau took on B camera duties. Though they canned most of the film’s footage, torrential weather conditions thwarted the film before it could be finished. One year later, however, Daviau photographed Spielberg’s short Amblin’, an official theatrical debut that served as the 22-year-old director’s calling card. Spielberg later said that this wordless lark, about young male and female hitchhikers trekking across the California desert, was “a conscious effort to break into the business and become successful by proving to people I could move a camera and compose nicely and deal with lighting and performances.” As such, the film, shot in a quick eight days, clearly had to dazzle on cinematographic terms. If nothing else, Amblin’, as disconcertingly carefree as a commercial jingle, is memorable for its sunbaked texture and natural lighting. One may not end up caring much for the callow, clearly middle-class hippies at its center (Spielberg himself seems ambivalent toward them), but the viewer is unlikely to forget the images of the two youths sharing a joint in silhouette against a darkening desert sky, a remarkable trick shot in a rear-view mirror that serves as its own kind of desert mirage, a stylized campfire-lit lip-lock, and the film’s serene opening images of Joshua trees outlined darkly against a sunrise. Spielberg had insisted that he and Daviau rise every day of the film’s shoot early enough to capture the sunrise, and film all day through to sunset, a good call for a film that relied solely on atmosphere. Daviau would next shoot a film for Spielberg fourteen years later. E.T. also opened with images of exquisitely beheld nature: the stunning California redwoods that give the film its initial burst of majesty. The two hadn’t collaborated since Amblin’ mainly because of strict regulations in the cinematographers union: Daviau wasn’t admitted for most of the 1970s, the decade when Spielberg had hit it big in Hollywood, rapidly ascending at Universal from episodic TV work to theatrical features. In 1979, after Daviau, following a drawn-out lawsuit against the union, had finally been allowed to join, Spielberg hired him to shoot a sequence designed especially for his “special edition” of Close Encounters of the Third Kind, in which a freighter inexplicably turns up in the middle of the Gobi Desert. By the time, E.T. was heading into preproduction, Daviau had been getting work in made-for-television movies, including the 1980 Scott Baio vehicle The Boy Who Drank Too Much, which Spielberg saw and had convinced him to hire him for this major, and at the time, top-secret project. In retrospect, it makes sense that a suburban-set movie-of-the-week, a genre that lives or dies on its intimate emotional effect, would provide something of a visual inspiration for E.T., which counters its grandiosity with vivid domestic detail. E.T. struck such a chord that Spielberg officially ascended to a stratosphere of fame usually reserved for actors or pop singers, and the film’s impeccably maintained look and feel are as crucial to its titanic success as the adorable alien dwarf at its center. A group of mouthy teens playing Dungeons & Dragons around a kitchen table, lit by an overhead stained-glass lamp, on a school night; daylight streaming through a dusty, toy-strewn kid’s bedroom; a two-story house’s lights cutting like an ominous beacon through the dark, quiet night—all contribute to the film a transformative visual mystery that few films prior had ever captured: rather than be parodied as plastic or dismissed as purely functional, suburbia here becomes a place of eerie beauty. (Even Close Encounters, with its weirdly distanced, even jaundiced, view of domestic life, had little interest in making the mundane magical.) E.T. is alluring because it seems to be taking place in our own childhood bedrooms and backyards. There’s so much naturalism here that even Spielberg’s most theatrical gestures—Dee Wallace’s mom walking directly into a pool of light before nearly bursting into tears about her ex-husband (“He hates Mexico!”); the invasion of the space-suited government scientists, flood-lit as though villainous things from another world—feel part of the authentic whole. 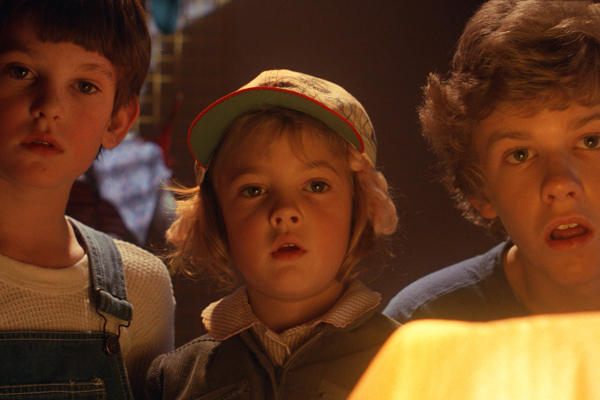 Of course, one cannot discuss Spielberg and Daviau’s achievement in E.T. without talking about their greatest challenge: the shooting of the title character himself. While creature designer Carlo Rambaldi was still creating the little outer-space goblin, Daviau was visiting his workshop with a borrowed Arriflex to see what kind of lighting would be necessary to help convince viewers that this doll, constructed from steel, polyurethane, and rubber, was real. If at any point, the audience took him as a puppet rather than a living, breathing being, the film’s precarious, meticulously designed world would instantly crumble. Daviau quickly learned that extremely low-key lighting was essential for such trickery; E.T. required a certain level of chiaroscuro, so that his surfaces were not all exposed at once. Almost always back-lit, with a small amount of bounce light shining off of him and a little glow in his glass eyes, E.T. is a feat of cinematography as well as engineering. In preparing for E.T., Daviau and Spielberg watched countless hours of footage shot by cinematographers they admired (such as Caleb Deschanel and Vittorio Storaro) with the sound turned off. In doing so, Daviau says they “developed a dialogue of taking about images.” By the time they made the Alice Walker adaptation, The Color Purple, they had become used to working together on big-budget movie sets (in between, Daviau had shot Spielberg’s gooey “Kick the Can” segment from 1983’s ill-fated omnibus Twilight Zone: the Movie), and had together imbibed a great deal of past masters’ films. The Color Purple has the look and sound of a traditional Hollywood epic, but with the subversive twist that it starred an almost completely African-American cast. It was explicitly modeled on films by John Ford—as well as the racially dubious Gone with the Wind, as Spielberg perhaps insensitively related to Walker during shooting, sending her into momentary paroxysms of doubt about his intentions. This is one of those rare cases in which the visual texture of a film itself became a source of controversy: Spielberg was accused of adding too much prettiness and gloss, therefore allegedly softening Walker’s more difficult source material. The Color Purple is surely beautiful—whether or not this is aesthetically dubious is in the eye of the beholder. The incandescent warmth that Daviau and Spielberg bestow upon Celie, whether played by Whoopi Goldberg or Desreta Jackson in her younger years, seems to me an act of immense empathy for a character in a constant state of subjugation and self-loathing: the world may not love her, but the movie sure does, supplying the dignity that the world refuses to afford her. Many critics bristled: here were two relatively privileged white, straight men in charge of visualizing a story about the black experience in the early twentieth-century America told from a lesbian character’s point of view. A questionable proposition in outline, but the emotional authenticity of a film cannot be faked, and The Color Purple is an overwhelming, even spiritually humane work. Daviau and Spielberg trade the unforced naturalism of E.T. for a more outwardly stylized, self-consciously old-fashioned attractiveness. 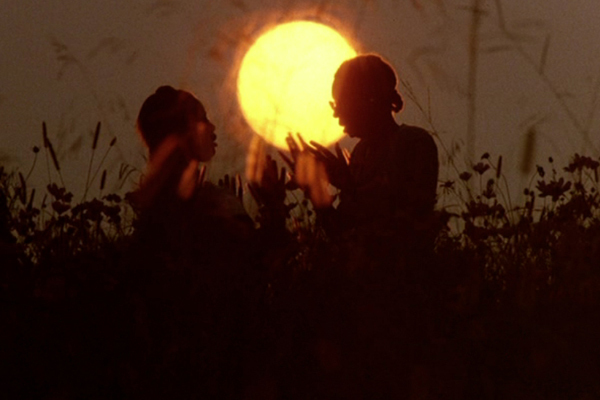 The film is often downright virtuosic, from the opening image of two sisters freely romping through an endless field of purple flowers (another kick-off scene focused on natural beauty); to the use of Fordian low angles, which serve to ennoble the characters; to the lovely, even iconic uses of silhouette—Celie and her beloved sister Nettie outlined behind sun-cast linens hanging in the breeze and later set against a blazing sun, but as old women, at the emotionally overwhelming climactic reunion. It’s a film of wintry, charcoal blues and warm, golden daylight. Spielberg took Daviau with him to China for his next film. The challenge was, an adaptation of J. G. Ballard’s memoir of growing up in British-controlled Shanghai on the eve of the Japanese invasion during World War II. 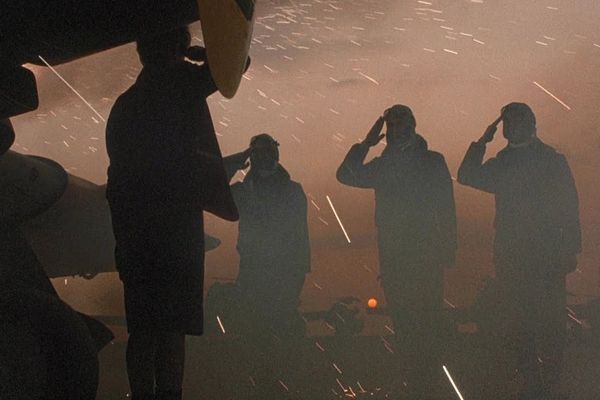 The film remains among the director’s highest achievements, and much of the credit must go to Daviau’s visuals, as Empire of the Sun’s narrative is, uncharacteristically and exhilaratingly for Spielberg, vaguely defined. Some critics were even confused about how they were supposed to feel when the film had ended (“You come out saying ‘What was that about?’” fretted Pauline Kael; “I don’t know what the film is about . . . I don’t know what Spielberg wanted to do,” exclaimed Gene Siskel); this was surely a new kind of criticism for Spielberg, normally accused of transparent manipulation and of making easily digestible movies. To put it simply, Empire of the Sun is a death-of-innocence film, in which Christian Bale’s Jim, a pubescent diplomat’s son, is forced to grow up rapidly amidst the violence of war. What makes it discomfiting viewing is that it views the world from the child’s confused point of view, one unable to distinguish “good” from “bad,” or trivial from important. Daviau and Spielberg initially give us coldly captured images of privilege, of Jim’s family attending a frivolous costume ball or his father idly putting golf balls around his backyard swimming pool. The boy first views the chaos descending upon Shanghai from the comfort of a limousine backseat—the coming terror intimated when a passing vendor’s dangling sack of meat smashes against the car’s window, leaving a foamy smear of blood that obscures Jim’s slack-jawed face. Soon the child will be separated from his parents and forced out into this world, where he’ll fall in with a pair of American thieves (shades of Oliver Twist, a book read by Celie and Nettie in The Color Purple) before being captured and placed in a Japanese internment camp. As Jim becomes further alienated from his former life, the film’s visual textures, surprisingly, become warmer, an aesthetic choice which coincides with Jim’s evolution from spoiled brat to worldly young man. By the time the film reaches its centerpiece sequence, in which Jim scales the camp’s watchtower to cheer on P-51 Mustangs as they zoom through the sky, Jim has become a lost child as movingly evoked as Elliott or Celie, and Daviau’s close-ups of twelve-year-old Bale are gloriously empathetic (this is arguably the actor’s greatest performance, devoid as it is of the self-conscious mannerisms he would later acquire). Our intimacy with Jim is especially remarkable considering the immense scale of Empire of the Sun. The project was originally intended for David Lean, with Spielberg serving as producer; when these plans fell through, Spielberg took over and proceeded to make a film in the David Lean style, an homage to Lean’s The Bridge on the River Kwai, another World War II internment camp epic, which Spielberg loved as a boy. (As a tribute to Lean’s Lawrence of Arabia and Ryan’s Daughter, Spielberg and Daviau even conducted test shoots for the film in 65mm, but decided against it.) Though it was the first American film to be shot extensively on location in China (following a year of negotiations between the Chinese authorities and Spielberg’s producers) and it involved massive crowd scenes, including thousands of Chinese extras, the shoot was by all reports an amazingly smooth one: precisely planned and without incident.